Aleen! This is for you. I am sooo behind on my posts, but I will try to catch up one post at a time. 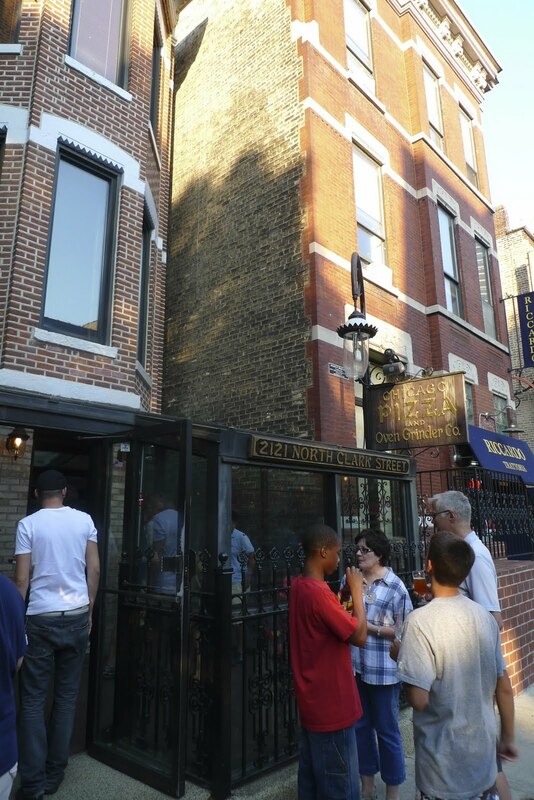 When my friends Mary and Jeanie were in town this summer, I wanted to take them to eat Chicago style pizza but knowing they wouldn't be fans of deep dish, we tried Chicago Pizza & Oven Grinder Co.
We came here on a Friday night I think and there were quite a few people waiting outside. Thankfully you could wait at the bar so we put our name down with the server who apparently remembers everyone's name and party size by memory. He claimed he's been doing this for over 20 years. About twenty minutes later, he found us at the bar and let us know our table was ready. I love places like this, where it feels like it's been around forever. The place is dimly lit and everyone gets seated in high wooden booths. 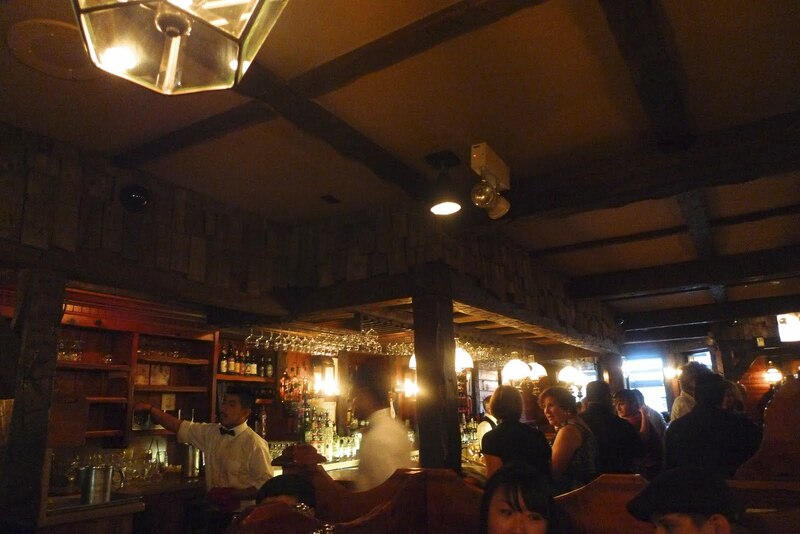 The ceilings feel low, adding to the cozy and warm feeling. Here's a pic of the cute menus we got to look at. 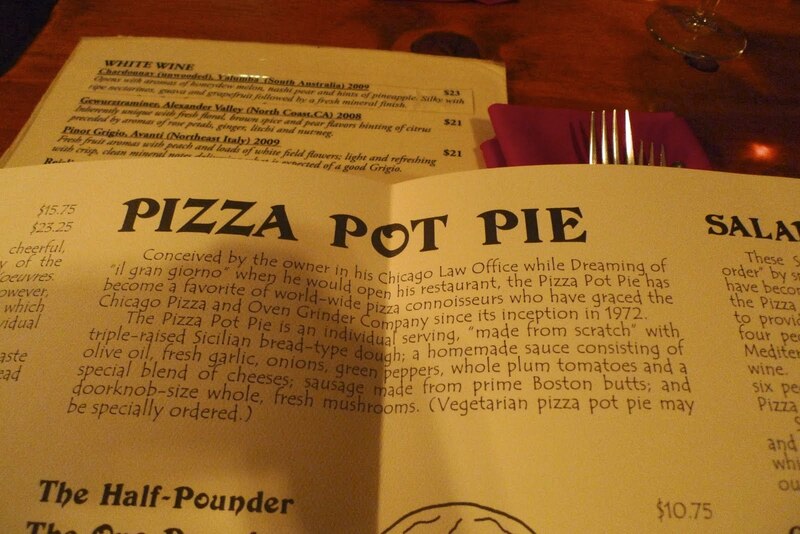 It gives a little history on how the place came to be, apparently a lawyer decided to open up a pizzeria in 1972. Kind of random, but glad to know that his restaurant still commands quite a following. The menu also gives a little description of their most popular items. The name of the place refers to their two specialities, the pizza and oven grinders, which are basically toasted sandwiches. 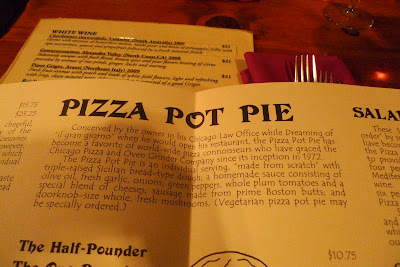 Since we were there for dinner, we opted for the pizza pot pies instead. 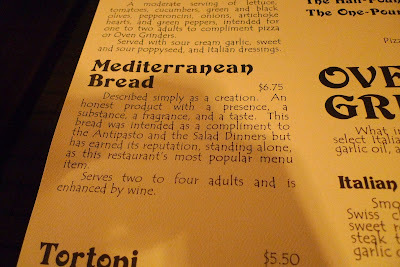 The waiter also recommended that we try their mediterranean bread, which they claim is their most popular menu item. I think every table ordered one to share as well, so we did the same. It basically is a gigantic thin piece of flatbread with italian seasoning. 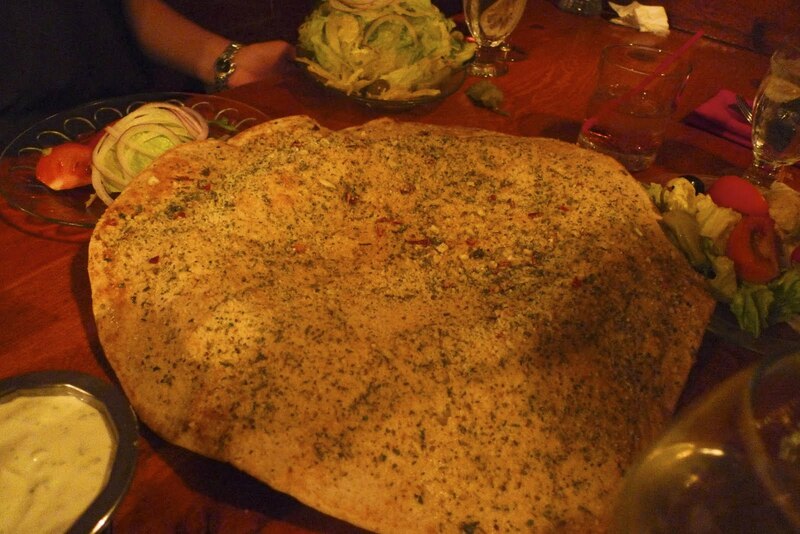 It was as huge as they claimed, but I wasn't the biggest fan of the taste or texture. 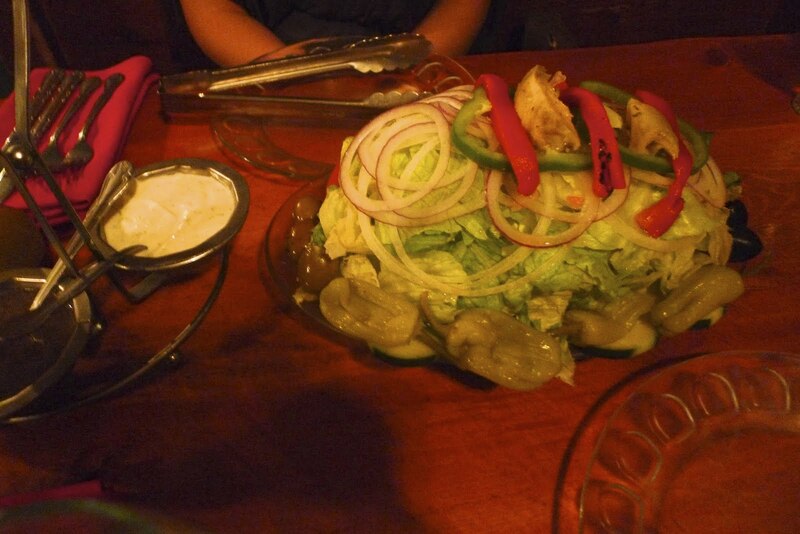 We also ordered a salad to share. They brought out their signature garlic and poppyseed dressings for us to try, which were both great. Now for the reason for our visit, the pot pies. This is how they come out, it looks like a gigantic mushroom but it's actually an upside down pizza with the dough on top. 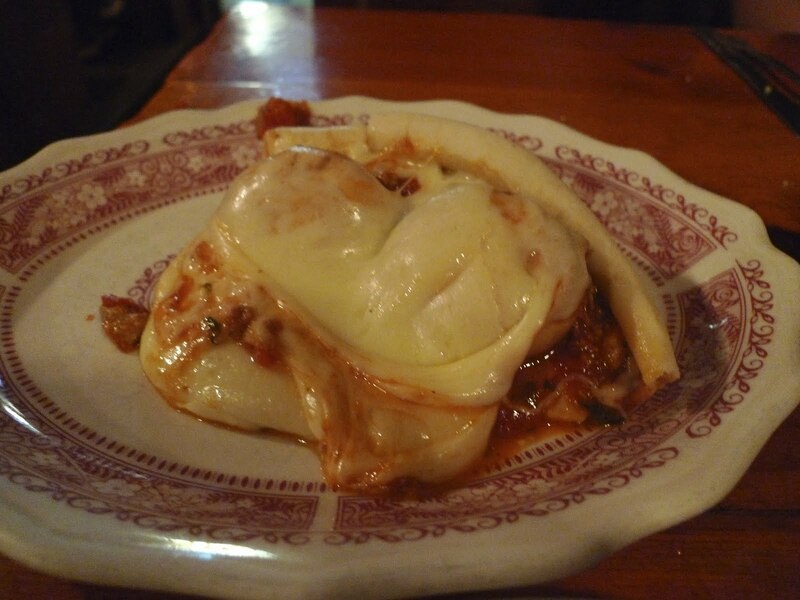 They layer cheese in a bowl, put the toppings in with the sauce and put a layer of Sicilian bread-type dough on top. They bake it until the dough rises up. 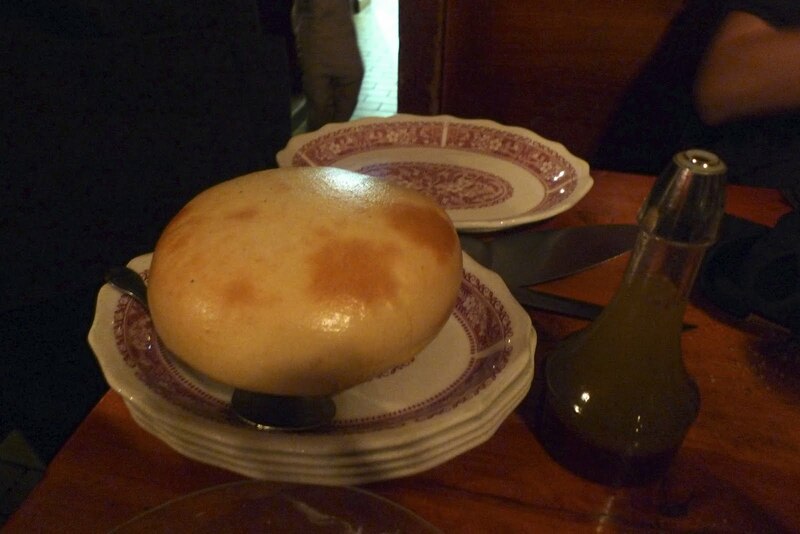 When it's ready to serve, they bring the bowl out and flip it over for you on a plate. The cheese since it's at the bottom of the bowl stays soft and gooey. People who loved burnt cheese on their pizza are probably not going to like this, but on the other hand, if you like lots of tomato sauce and like melted cheese, you will love this style. Since July, I have since gone to Burt's Place (of Anthony Bourdain fame), Pequod's, Coalfire Pizza and Great Lakes (named best pizza by GQ). It's hard to pick my favorite because they are all so different. The deep dish pizzas are pretty similar at Burt's Place and Pequod's and it's because Burt Katz used to own Pequod's. 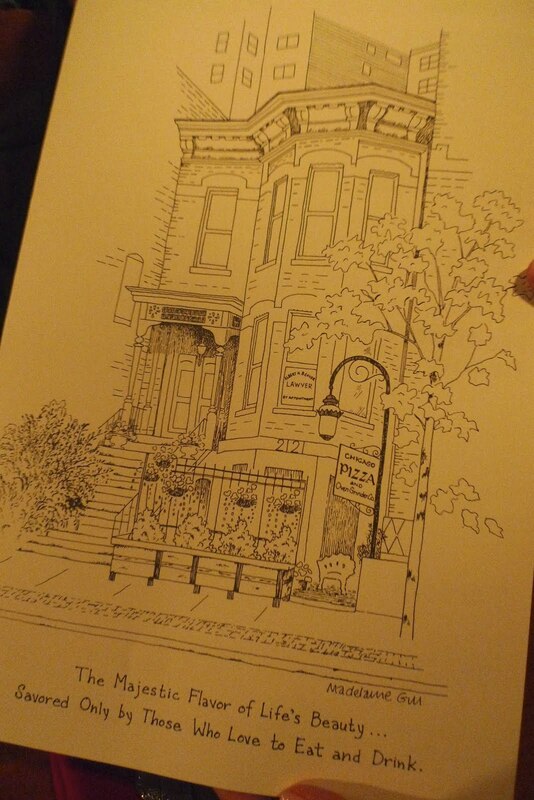 He sold it and then later started his own place in Morton Grove. Their pizzas are characterized by their caramelized, crispy crust. Driving out to the burbs for a slice of pizza is not that uncharacteristic for me, but for others, Pequod's is a pretty good option and much more convenient. Even though Chicago is known for their deep dish pizzas, I think we have some pretty great thin crust options as well. (FYI - I tried the thin crust at Pequod's and wasn't impressed - stick with the deep dish there). I tried Coalfire a few months ago for Neopolitan style pizza, which they bake in their coal fired oven, hence the name, and their owner was as nice as could be. I'm not sure why I haven't gone back, but I should. I also went to Great Lakes recently and loved everything I had, including their roasted cauliflower and fennel salad. Their pizza definitely lived up to the hype and I loved their communal seating and vibe of the whole place. The wait was not as horrendous as I had expected either so don't let that deter you. That looks tasty! Im moving to Chicago soon after I find a Chicago moving company!